A Little Brain Storming- When you are ready to optimize your blog, you will need to ma ke a list of keywords you are targeting. Include all keywords broad and narrow related to your niche. You can use Google Keyword Tool to find keywords related to your niche. After you have the list, get all the keywords with high searches. This will give you an idea about the topics people need information. If you are trying to optimize your blog for the first time, it is not advisable to target main keywords in round one, because of the competition you will face. 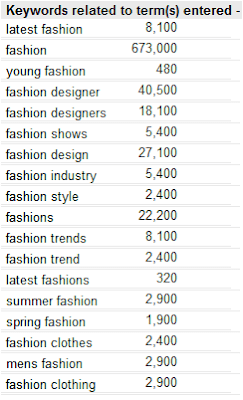 Searches performed on Keyword Fashion in month of August is 673,000, but targeting it may not lead you anywhere near to first two SERPs(Search Engine Result Pages) because Google returns highly targeted 565,000,000 results for this search. If you target keywords like Fashion Trends with 8100 searches but lesser competitors, and appear on a prominent position in the first SERP, you have a possibility of attracting 8100 to your site per month for this single keyword, and that is not bad for a starting. 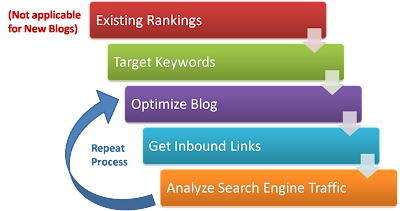 Once you start getting traffic for the shortlisted keywords you will be able to perform better on broader ones.